At Jim West Talks Chess, my blog post on the Sozin Attack has been viewed often. As a follow-up to Sunday's blog post, here is a news flash from Howard Stern's website. 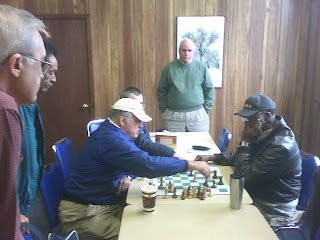 Marshall Chess Club President Dr. Frank Brady played two games against Howard over the weekend. Dr. Brady said, "He's a good player! I did win, but he held me right down to the end game. He's much better than he thinks he is." Dr. Brady said Howard has an open invitation to return. Lev Zilbermintz does well with the Philidor Counter Gambit on the ICC against FIDE ranked players named Guerrero or Rodriguez. Previously Zilbermintz defeated WIM Alejandra Guerrero Rodriguez. 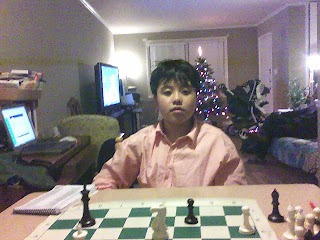 Now he wins against GM Enrique Rodriguez Guerrero. 1.e4 e5 2.Nf3 d6 3.d4 f5 4.dxe5 fxe4 5.Ng5 d5 6.e6 Nh6 7.c4 Bb4+ 8.Nc3 d4 9.Qh5+ g6 10.Qxh6 dxc3, White resigns. You can read here the October 2006-March 2007 double issue of Atlantic Chess News. My article on the Philidor Counter Gambit is located on pages 22 and 23. Satellite radio shock jock Howard Stern turned schach jock for a few hours when he and Beth Ostrosky visited the prestigious Marshall Chess Club earlier today. While I and the other participants in the one-day schedule were playing game/30 in round two, Stern sat upstairs chatting with club president Frank Brady. 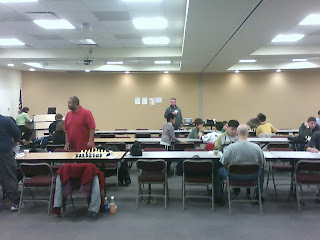 When the schedules merged in the third round, Stern walked downstairs and watched us play chess in the tournament room. Maybe the publicity surrounding the deaths of Bobby Fischer and Heath Ledger is giving American chess a much needed shot in the arm. Players in the two-day schedule told me that a TV camera crew was filming inside the club on Saturday while the tournament was in progress. The following game would have been exciting enough, even without Howard Stern as a spectator. 30.h4 Bxh4 31.g4 Bg5 32.gxh5 Bxe3+ 33.Kh2 Qxh5+, White resigns. In today's Viking quads at the Somerset Ramada, I drew this game. 61.Rc8 Ra2+ 62.Kg1 Kh3 63.Rc1 g3 64.Rd1 Rg2+ 65.Kh1 Re2 66.Kg1 Re3 67.Rb1 g2 68.Ra1 Kg3 69.Rb1 Rf3 70.Rc1 Ra3 71.Rb1, draw. There are times in life, as in chess, when you follow your instincts because you are unable to know for certain what the correct move is. That is what happened to me on Monday morning. I awoke to an e-mail from Jason Payn, who produces a talk show on BSport Radio in Auckland, New Zealand. Having seen my tribute to Bobby Fischer, Payn requested 7 to 8 minutes of my time for a phone interview (at 12:40 pm EST Monday) on a radio show hosted by Ian Smith, Dean Lonergan, and Nathan Rarere. Somehow I felt it was the wrong move for me, just as sometimes I heed my intuition in a complicated middlegame. Thus, I never followed up on Payn's offer. Still, I am flattered that someone, in as faraway a place as New Zealand, could read my blog post and like it so much! Here is a story, from Monday's New York Post, on the Sloan-Truong scandal. Marika sent me an e-mail on Friday stating the FIDE master Boris Baczynskyj passed away a week ago. 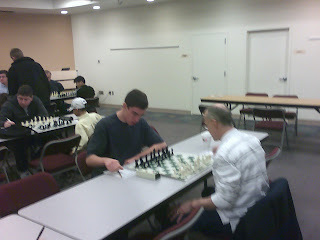 Here is the last game that I ever played against Baczynskyj, on 7/21/2007, ending in a draw. I took these pix on Saturday at the Hamilton quads. The first photo shows tournament director Ed Sytnik. Next you see players analyzing a game. Usually I bring The New York Times with me when I play in a tournament. But Saturday's front-page story was not good news. When I got home, I photographed one of my prized possessions, which I bought second-hand. At Saturday's quads in Hamilton, I drew these two games. 31.Bxd5 Bxd5 32.Rxd5 bxa5 33.Rxa5 Rxb2 34.Rxa6 Rc2 35.Rxf6 Rxc3 36.Kf2 Kg7 37.Rf3 Rc2+ 38.Kg3 h6 39.h4 Kg6 40.Kh3 h5 41.Rg3+ Kh6 42.Rg5, draw. 50.Ne6+ Kh5 51.Nf4+ Kg5 52.Re6 Qd1+ 53.Kg2 Qf3+ 54.Kxf3, stalemate. 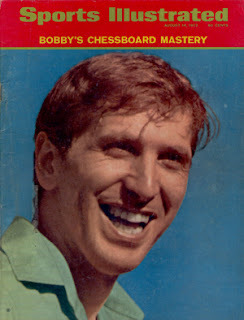 Here are magazine covers featuring Bobby Fischer. And by clicking here, you can watch 15-year-old Bobby Fischer on I've Got A Secret. On the evening of January 18th, Atlantic Chess News editor Steve Ferrero called me on my cell phone at work to inform me of the death of Bobby Fischer. He requested that I write an article on Fischer for the upcoming issue of ACN. As I drove home that night, it occurred to me what an impossible assignment I had been given, especially since I had never crossed paths with Fischer. 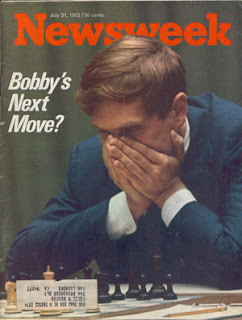 To me, Bobby Fischer was always the offstage character in the play who never makes an appearance, although his name gets mentioned a lot. Nevertheless, I will try my best to honor Fischer in writing. I will begin by stating that Bobby Fischer's passing away at age 64 is as bizarre a coincidence as Houdini's death on Halloween. 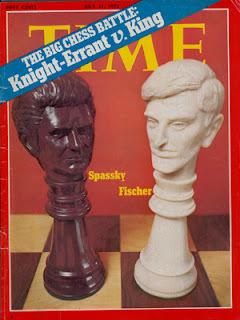 It was Fischer's great misfortune to have been born and raised in a country where chess is held in low regard. Imagine Van Gogh in a land of the blind, or Mozart in a land of the deaf, and basically you have Bobby Fischer in America. Fischer's chess games were "monuments of unageing intellect", to quote verse from the poet Yeats. 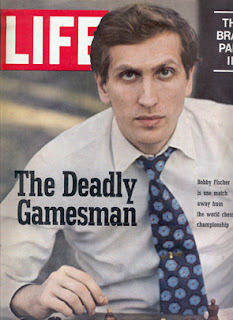 I am not sure what it says about my life, but no individual had more of an impact on it than Bobby Fischer. It started at a backyard barbeque on the Fourth of July in 1972. While waiting for my hamburger to grill, I noticed a discarded copy of the Daily News near poolside. The front-page banner headline "Chess Match On Again" struck me as curious. So I began reading the story, and my life was never quite the same again. 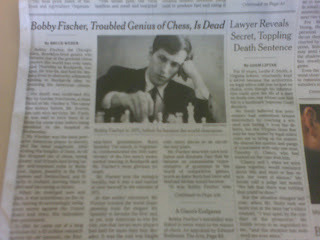 Vaguely I already knew who Bobby Fischer was, mostly from playing chess as a kid at the playground during summer vacations. Sometimes I would make a good move, only to hear my opponent exclaim, "Who do you think you are - Bobby Fischer!" But what happened in the summer of '72 was magical. For a brief moment in time, it was cool to play chess in the United States. By summer's end, I had saved enough money to join the USCF and the Marshall Chess Club. 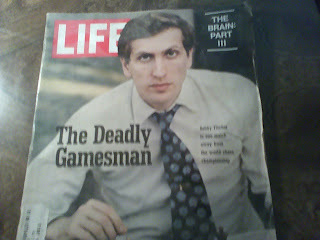 For the next fifteen years, Bobby Fischer was my idol. 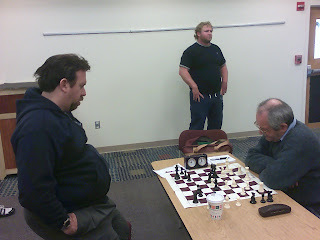 Somewhere in the late 1980's, I discovered Paul Morphy's brilliancies, including those in the Philidor Counter Gambit. But I still play many of Fischer's openings, for example the Sozin Attack and the exchange variations in the Ruy Lopez and Caro-Kann. As far as Fischer's politically incorrect remarks are concerned, I never took them seriously, even though the twin towers burning on 9/11 could be seen from my hometown in New Jersey. Fischer was an artist. As an undergraduate and graduate student, majoring in the arts, I studied many famous novelists, poets, painters, and composers. Put Bobby Fischer in a room with the rest of them, and he might have been the sanest person in the bunch! Much of Fischer's time away from the chessboard was spent in distancing himself from anyone who would attempt to associate with him. You see, it really was Bobby Fischer versus the rest of the world! Check out the April-June 2007 issue of Atlantic Chess News here. Here is the July-September 2007 issue of Atlantic Chess News. My article on the Fajarowicz variation can be found on pages 15-16. You can read the October-December 2007 issue of Atlantic Chess News here. There is a link to my book review, as well. Here are links to the first page and second page of A. C. van der Tak's article Exit 3...f5 in the Philidor? from Forum 84. In an 90-minute program on Dutch television, Garry Kasparov discusses chess, politics, movies, opera, and soccer. Even though the introductory narrative is in Dutch, the interview is in English. You can watch it here, but you must click on "bekijk uitzending". 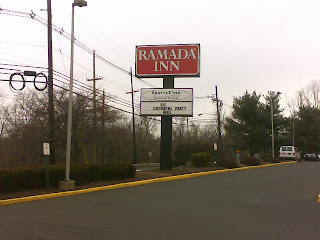 Between my games yesterday at Cherry Hill, I took these photos. 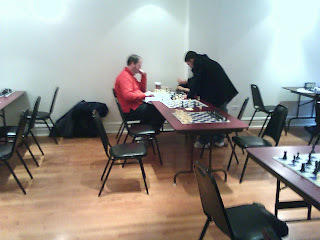 The above photograph shows the critical moment in the opening round game between national master Michael Katz (White) and tournament director Dan Herman (Black). Although Herman has a winning position, he blundered later in time trouble and lost, thus missing his chance to defeat a master for the first time. 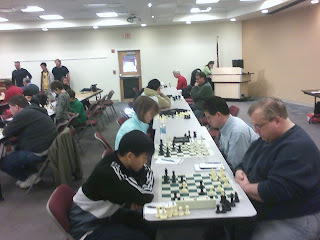 While the Swiss was being played in the rear of the room, the quads took place in the front. Here you see Class A player Shaun Pilkington (Black) from first round action. This is what the tournament room looks like from the back entrance. Fewer masters than usual showed up for today's game/30 Swiss at Cherry Hill, enabling me to win the tournament with a score of 3-0-2. Here are the games. 14.c5 dxc5 15.Ba3 b6 16.d6 Bb7 17.Bxb7 Nxb7 18.dxc7 Qxc7 19.Ng5 Rae8 20.Qb3 Qe7 21.Red1 h6 22.Nf3 Qf7 23.c4 Na5 24.Nd2?? Nxb3, White resigns. 31.cxd4 Bxe4 32.Qxa5 bxa5 33.Rxe4 exd4 34.Kf1 d3 35.Ke1 d2+ 36.Kd1 Kf7 37.Re2 a4 38.Rxd2 Rb8 39.bxa4 Rb4 40.a5 Ra4 41.Rd7+ Kg6 42.Rxa7 Rxa2 43.g4 Rxh2 44.Ke1 Ra2 45.a6 Kf6 46.f4 Kg6 47.Kd1 h5 48.gxh5+ Kxh5 49.Rxg7 Rxa6 50.Ke2 Ra3 51.Kf2 Kh6 52.Rg8 Kh7 53.Rg5 Kh6 54.Rg3 Rxg3 55.Kxg3 Kg6 56.Kg4 Kf6 57.f5 Kg7 58.Kg5 Kf7 59.f6 Kf8 60.Kg6 Kg8 61.f7+ Kf8 62.Kf6, stalemate. 17.Qc3 g5 18.Nd3 g4 19.Nh4 Qg5 20.Nxc5 bxc5 21.e3 Qxe5 22.Qxe5 Nxe5 23.Rfd1 d6 24.Bxb7+ Kxb7 25.Kf1 Kc6 26.Ke2 Rb8 27.Rc2 Rb3 28.Rdd2 Reb8 29.f4 gxf3+ 30.Nxf3 Nxf3 31.Kxf3 f5 32.h3 h5 33.h4 Re8 34.Re2 a4 35.Kf4 Re5 36.Kf3 Re8 37.Rcd2 Re4 38.Rd5 Re5 39.Rxe5 dxe5 40.Rd2 Kb6 41.Rc2 Rd3 42.Ke2 e4 43.Rd2 Rb3 44.Kf2 Kc6 45.Ke2 Rb8 46.Ke1 Rg8 47.Kf2 Rb8 48.Ke1 Rg8 49.Kf2 Rb8 50.Kf1 Rg8, draw. 17.Rxd5 Bxe5 18.Rxa5 Bc7 19.Rc5 e6 20.Rxc6 Rg7 21.Bxe6 Bb7 22.Rc4 Be5 23.Bd4 Bxd4 24.Rxd4 Re7 25.Bd5 Bxd5 26.Rxd5 Rc8 27.c3 Rc4 28.Re1 Kf7 29.Rd4 Rxd4 30.cxd4 Kf6 31.Kf1 Rb7 32.b3 Kf5 33.Rc1 Rd7 34.Rc4 Ke6 35.Ke2 Rd5 36.Ke3 Rh5 37.Kxe4 Rh4+ 38.Ke3 Rxh2 39.g3 Rh1 40.Rc6+ Kd5 41.Rxa6 Re1+ 42.Kf3 Kxd4 43.Ra7 Ra1 44.a4 Ra3 45.Rxh7 Rxb3+ 46.Kg4 Ke5 47.f4+ Kf6 48.Ra7 Ra3 49.Ra6+ Kg7 50.Kh4 Rf3 51.a5 Ra3 52.g4 Rb3 53.Kg5 Rb5+ 54.Kh4 Rb4 55.Kg5 Rb5+ 56.f5 gxf5 57.gxf5 Rb1 58.Ra7+ Kf8 59.Kf6 Kg8 60.a6 Rb6+ 61.Kg5 Rd6 62.f6 Rd1 63.Rb7 Rg1+ 64.Kf5 Rf1+ 65.Ke5 Re1+ 66.Kd4 Rd1+ 67.Ke3, Black resigns. 14.Bxf6 Qxf6 15.O-O Ne3 16.Qb3 Nxf1 17.Rxf1 Qb6 18.Qa4 Bd7 19.Qh4 Rf8 20.Ng5 Rxf1+ 21.Bxf1 h5 22.Qf4 Bf5 23.Qe5 Qd8 24.h4 Nd7 25.Qf4 Qf6 26.Kh1 Qe5 27.Qf2 Rf8 28.Bc4 Qd4 29.Qxd4 cxd4 30.d6+ Kg7 31.Nb5 d3, White resigns. Since I e-mailed the following correction on December 25th to Paul Hoffman's website http://paulhoffman.wordpress.com/kings-gambit-corrigenda/, no one else has unearthed any mistakes. In his Blog Trekking, December 2007 post, Mark Weeks makes mention of my E-mail from Paul Hoffman. On Sunday, Ziping Liu (pictured below) won his quad at Westfield with a score of 1-0-2. Here is his first round draw. Although the scoresheet is incomplete due to the game/45 time control, you can see evidence of Ziping's tactical style. Frederic Fournier has e-mailed to me an article in Forum 84 by A.C. van der Tak titled Exit 3...f5 in the Philidor?. Van der Tak writes, "Recently the great champion of 3...f5, James West, discussed with Dennis Monokroussos West’s suggestion of 6...exd4 7.Nxd4 Qe7+, which does not inspire much confidence after 8.Be2, but even 8.Qe2!? looks like a strong reply." The following game, won by White, is given. If instead of 8...Qxe2+ Black had played 8...h6, van der Tak gives 9.Nge6 as clearly advantageous for White. This drawn game of mine, played against national master Dragan Milovanovic in December 2005, would indicate that White is only slightly better. 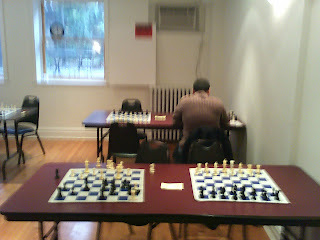 As for 8.Be2, here is another drawn game of mine against the same opponent, played in June 2007. 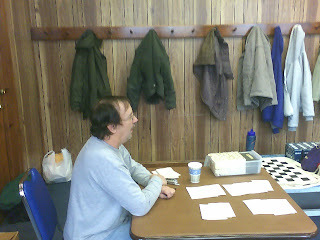 Between games at yesterday's January Under 2300 tournament, I found time to snap these photos. 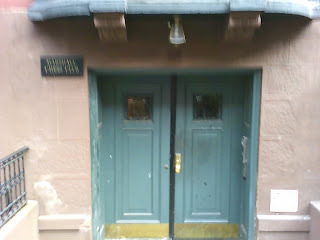 Here is the front entrance to the Marshall Chess Club. Below is the newly refurbished tournament room, downstairs at the club. In the final photo, a couple of players analyze their game. Today I played in the one-day schedule of the January Under 2300 tournament at the Marshall Chess Club, finishing with a score of 1-0-3. The first two contests were played at game/30, both ending in draws. Here are the two slow games, with time controls of 30/90 followed by game/60. The first of these is a real Marshall swindle, as I was busted out of the opening but somehow managed to draw. Now I should have played 11.dxe5. 56.Nd3 Rxe6+ 57.Kxe6 Kf1 58.Kd5 Ke2 59.Kc4 Kd2 60.a4 a5 61.Kd4 c1=Q 62.Nxc1 Kxc1 63.Kc5 Kb2 64.Kb5 Kb3 65.Kxa5 c5 66.Kb6 c4 67.a5 c3 68.a6 c2 69.a7 c1=Q 70.a8=Q Qe3+ 71.Kb7, draw. 66.f4 Ra1 67.Kg4 Rg1+ 68.Kf5 Ke7 69.Rh6 Ra1 70.Rh7+ Kd6 71.a7 Ra5+ 72.Kf6 Ra6 73.f5 Kd5+ 74.Kg5 Ke5 75.Re7+ Kd5 76.f6 Ra1 77.Kg6, Black resigns.